Why are we afraid of death? What is acceptance in the face of cancer? How do I decide whose advice to take? How to relax in the certainty of death? Ought we to tell someone when they are dying or not? Is the theory of reincarnation true? What is happening around the dying? How best to support a dying person? My young daughter is asking about death: what do I tell her? How can I celebrate death as you suggest? Osho responds to these questions and many others from those who find themselves inexplicably attracted to the subject, as well as from those who are facing imminent death and from their carers. He does not simply show how our fear of death is based on a misunderstanding of its nature; he also shows how dying is a tremendous opportunity for inner growth and how death is the most sacred of mysteries. Death is not an event but a process, and one that begins with birth. Each exhalation is a small death; each inhalation, a rebirth. When life is lived consciously and totally, death is not a catastrophe but a joyous climax. Start reading Art Of Living and Dying on your Kindle in under a minute. Osho has been described by the Sunday Times in London as one of the “1000 Makers of the 20th Century”. About his own work, Osho has said that he is helping to create the conditions for the birth of a new kind of human being. Running like a thread through all aspects of Osho’s talks and meditations is a vision that encompasses both the timeless wisdom of all ages past and the highest potential of today’s (and tomorrow’s) science and technology. Osho is known for his revolutionary contribution to the science of inner transformation, with an approach to meditation that acknowledges the accelerated pace of contemporary life. His unique OSHO Active Meditations are designed to first release the accumulated stresses of body and mind, so that it is then easier to take an experience of stillness and thought-free relaxation into daily life. The Art of Living and Dying is my 17th Osho book. There is a pithy saying that "when the student is ready, the teacher will appear" and the right Osho book has always showed up when I was ready to read it. At 70 years of age and having seen my father during his last two weeks of his 101 years on this wonderful planet, the Art of Living and Dying confirmed for me much of my thinking regarding death. My father kept telling me over and over, " I just want to go home". He stopped eating and drinking and just rested peacefully until he stopped breathing. The book assured me that I am on the right tract in preparing for that time when I can say as my dad did ,"I just want to go home". I was most impressed with the how Osho handled the subject of reincarnation, the continuation of life. No one can understand reincarnatiuon by listening to someone else's explanation. He made that very clear and encouraged us to find the answer ourselves through meditation. He knows the answer from his own experience and we must find it, even if our answer is different from his, through our own experiences. Osho is very repetitive to the point of boring at times but if you stay with him, you'll discover nuggets of wisdom that's worth the wait. It may be the last Osho book I'll buy because I've gone as far as he can take me. Now I'm on my own. Thank you Ohso. 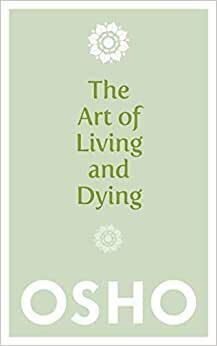 For you Osho lovers out there, The Art of Living and Dying is a great book to read and I highly recommend it. Don't be afraid of death. It began with and is part of life. There's no life without death and no death without life and so life and death will never end. Good luck! Helped my father accept death in his last month of life. Great book, a lot of clear Osho wisdom . Very helpful book to read, especially for people ,who deals with the death in the family. Love this book, it helps me a lot . I have read 70 books of Osho and this is one of my favorites. His clarity to explain such things as dead are great, his wisdom and intelligennce are unlike any other Master that has ever step on this planet..